Reading this book felt a little like watching Fawlty Towers. In the British TV series Fawlty Towers, the viewer constantly anticipates what will go wrong next. The comedy is proportionate to the level of disaster, and in the show disaster is around every corner – and frustratingly, Bazil Fawlty only makes it worse! Similarly, reading Seven Events That Shaped the New Testament World (hereafter Seven Events) felt like watching Fawlty Towers in that I would arrive to each new section with both a certain level of dread and macabre curiosity, wondering what would “go wrong” here. But I’m getting ahead of myself, let me back up and introduce the book. In Seven Events, Warren Carter seeks to “help [our] understanding of the New Testament” by “provid[ing] an orientation to some important aspects of the early Jesus movement and the New Testament” (loc 63). To achieve this end, he chooses seven key ‘events’: four from before Christ, and three that resulted from His coming. Carter uses each event as a launching pad and jumps to related cultural dynamics that were important to Christ-followers, often making connections to relevant New Testament passages. Carter’s style is very accessible and enjoyable to read; he presents history in a very interesting and understandable way without giving the impression of reductionism. This is all well and good, and it’s what drew me to this book in the first place. I want to better understand the setting of the New Testament, and apply this to my reading of the New Testament. So where does this book go wrong? To put it simply, Carter’s liberal theology and scholarship permeates this book like leaven. I looked at some reviews before reading this book, and while some mentioned something along the lines of “not agreeing with everything Carter says”, I regret to say that I disagreed with the majority of what Carter said, at least when it came to Scriptural interpretation and application for the believer. It is for this reason that reading Seven Events felt like watching Fawlty Towers. It was both entertaining and terribly frustrating. When reading the book, I continually thought to myself “He can’t be serious?” but unlike Fawlty Towers, however, Seven Events is not a comedy, and my frustration with the book only resulted in laughter some of the time. I am no expert as to whether the history is good. I greatly enjoyed the historic sections, but ultimately Carter’s liberal views and unwillingness to represent conservative responses were the core issues for me. In the context of stating that the New Testament authors disagreed on how Christians should engage with the Roman empire, Carter suggests that 1 Peter 2:17 actually encourages believers to make offerings and sacrifices to the emperor! “Is 1 Peter requiring believers to participate in such activity involving idols? That sounds strange, but it may be 1 Peter’s strategy. Certainly such an expectation would be consistent with the rest of 1 Peter’s insistence that Christians earn a good name with socially cooperative behavior.” (loc 1478). After overstating his case here, he then finds other passages of the NT that speak negatively towards the Roman empire, and tries to show that the NT doesn’t present a consistent viewpoint on this issue. Paul “probably did not write” Ephesians, Colossians, 2 Thessalonians, 1 and 2 Timothy, and Titus (loc 2105). They were instead written by his followers, “a generation or two after Paul died”. Carter’s insistence that this was not a problem, but rather a way of “honoring the teacher” is unpersuasive. He agrees with scholarship that sees the theology of say, Ephesians, as too developed and inconsistent with Paul’s views. Carter also rejects other traditional authorship such as Petrine authorship of 1 & 2 Peter and the Gospels. Carter suggests that Paul may not have a consistent underlying theology, but rather responded to church issues somewhat ad hoc (loc 2063). Therefore, it would be futile to try and understand Paul’s theology in any logically coherent way, let alone the other letters attributed to him. The book of Acts is not necessarily historically reliable, rather it is a “reinterpretation in its presentation of Paul and the hero of the story” (loc 2170). Carter sees Acts as conflicting with what we know of Paul from Carter’s limited list of Pauline writings. The fact that in Acts most Jews reject Paul’s message is apparently contradictory with Paul’s hopeful attitude towards the Jews. In Carter’s words it is, “the exact opposite of what Paul says in Romans 11…Paul gets a makeover in Acts.” (loc 2199). 1 Peter “unfortunately assumes and maintains slavery (2:18-25) and the subordinate roles of women (3:1-7).” (loc 2214). Here, Carter not only rejects any nuance in the NT’s teaching on slavery and gender roles, but he sits as judge over the Word of God! “The church produced the canon” (2402). Carter goes on to imply that the church deemed scriptural status on certain books, leaving out other equal contenders such as Clement’s writings and The Shepherd of Hermas. However, this is not the only way of looking at the canon. Michael Kruger helpfully points out that the New Testament documents were canon and authoritative at the time of their writing, but the church councils were “part of the process of recognizing a canon that was already there.” (emphasis mine). 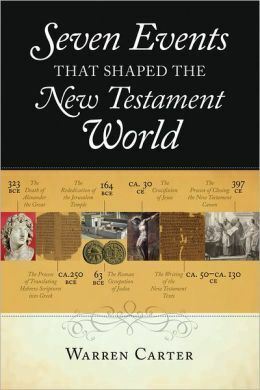 “All the documents that would later become part of the New Testament collection were written in the time period of ca. 50 – ca. 130” (loc . 2519). This is a very late date, but of course this is necessitated by Carter’s view on authorship, since to believe much of the NT is pseudonymous requires the authors to be dead, thus pushing back the time of writing! Now of course in identifying these as issues, I am also revealing my own theological stance. Some holding different views may think I am being overly harsh in my review, and I do hope this is not the case. However, I expect others will be glad to know about these issues so they can properly evaluate whether they should read the book or use it in a class. Carter’s approach, style and format are all very enjoyable, but for me the content is where this work falls flat. And of course, content is king. However, if my complaints against the content are irrelevant to the reader, then I am sure they will profit from this book due to its other strengths. This book would fit well as part of a New Testament background or introduction class for college age students. Carter’s style is fun and keeps the reader engaged. I personally would stay far away since ultimately it encourages a skeptical and condescending attitude towards the Word of God.